Back before I was ready for kids of my own, I used to get agitated when I would hear that phrase. 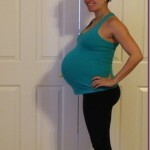 “You should give your body at least 9 months or a year to return to pre-baby size.” I’d think Why? Have you seen Jessica Alba? 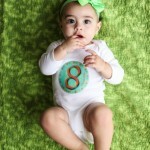 She was rocking a bikini way sooner than 9 months after having her baby. 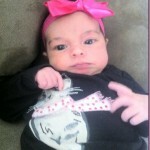 When you read gossip magazines, you’re infiltrated with celebrity body-after-baby photos. Women are celebrated if they lose the weight quickly, slammed if they don’t, and it can skew your view of what’s expected/exaggerated. Way back in the day, before Livi was a twinkle in my eye (and my heart), I wondered about how my body would react to gaining weight while pregnant. Here I was, maintaining a solid weight loss for so long… how would I feel to watch weight creep on, slowly and drastically? Every time they weighed me at the midwives’ office, instead of dreading it, I knew that every pound meant that my baby was growing. She was healthy, and that’s all that mattered. I watched my stomach grow round and huge, and could picture her inside, swimming and hiccuping around. My booty was bigger and rounder, my cups spilleth over, and my skin was dewy and glowing (when it wasn’t sallow and green with morning sickness, haha). 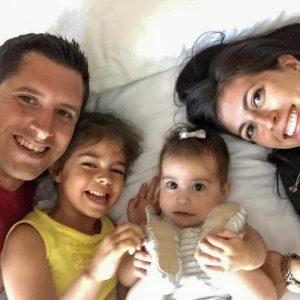 Before I had Liv, I thought that it would be hard for me to watch my body change, but the fact that I enjoyed every change instead of fearing it was a true sign that I was mentally ready to have a baby. If it would have happened sooner, like right after our marriage, maybe I would have had a harder time. I was still really insecure with my body -I think that it’s just part of the package when you’ve been previously overweight- and I guess I’ll never know how well I would have handled it. I’d like to give myself the benefit of the doubt and think I’d be mature enough to realize the miracle that was happening and let my insecurities fall to the wayside, but I like I said, I’ll never really know. So here I am, 9 months out from having a baby. Am I where I was before? In some ways yes, in other ways, not at all. While I was pregnant, I’m thankful that it was easy for me to stay active. Almost-daily cardio sessions felt great, whether it was a walk with Bell or teaching a Zumba class. Even though cardio was no prob, when it came to strength training, I took it easy. I didn’t want to lift super heavy weights, so I worked to maintain where I was without increasing anything. Before long, strength training no longer felt good or “right,” so I stopped. My abs are finally visible again, but my lower stomach still has a way to go, and that’s ok. Despite using stretch oil religiously, I have stretch marks. They’ve faded, but will probably always be there. I’ll proud of my little souvenirs and am so thankful to have been able to carry and deliver a healthy baby. Close up, you can see the silver slivers that I’ll never take for granted. It’s the kind that allows me to exercise for health and enjoyment, while indulging in treats on a regular basis. If I wanted to eat only chicken breasts, green veggies and 1/2 sweet potato all day (aka fitness comp diet), my abs would look very different, but I don’t want to live like that- I like food too much. This is despite my breastfeeding woes and exclusively pumping for months. This may be TMI, but I had always heard that breastfeeding gives you saggy breasts. I only breastfed for almost 6 months, so maybe the amount of time has something to do with it, but there are no visible effects from breastfeeding. Now, internal effects… there are a few. I was debating on writing about this in detail, but I’ve talked about it a little before- I damaged the tissue in my breasts from pumping. I was desperately doing everything I could to increase milk supply, so I would pump after every feeding and sometimes in between every feeding.. on high.. for as long as I could take it. I’ve pumped blood a few times and then would cry as I dumped it out (the midwife said I could feed it to her, but the thought of giving her bloody milk on top of the fact that I couldn’t make enough for her broke my heart). I’m still healing, and sometimes I’ll feel intense jolts of pain- so that’s why I’ve been taking it easier on the arm/chest strength training. By eating well and exercising, it was more feasible for me to continue those patterns and gain a healthy amount of weight during my pregnancy (34 lbs). Yep, that’s right. There were certain times when I really wanted to go to the gym because I hadn’t had alone time all day, but I was truly exhausted. So, if Liv was sleeping, I napped or went to bed early. When you’re sleep-deprived, your body will hold onto fat. As a new mom, you are perpetually sleep-deprived. So while it’s important to get in some movement for an energy boost if you have a small amount of time, if you’re dragging and wouldn’t enjoy it: rest. This may seem like a contradictory tip with everything else I’m saying, but it’s a pretty passive way to guide your body back into place without thinking about it too much. I’m pretty sure this is the reason why my old clothes fit. It helped me figure out how to use my core again -I was hardly engaging it for the pregnancy because I felt like contracting my abs was smushing Liv- and the hip shrinker helped rein the hips back in. You can think I’m cray, but I think it worked. Stress can actually make your body hold onto and create more fat. Be patient with yourself and remind yourself to enjoy every moment, even the not-so-fun ones, and that your baby could care less about what your body looks like. I can now honestly say that babies grow SO fast. It feels like just a week ago that we were giving her her first bath, and now we’re starting to plan her first birthday party. It’s important to me to enjoy Liv as much as possible, while nourishing her, caring for her and giving her all of the love I can. At the same time, exercise can be a fantastic way to relax and unwind, depending on how you’re feeling. Way before I was pregnant, reading posts about baby weight loss tips were so fascinating to me. Then I realized when it was my turn, it wasn’t that big of a deal. I was so focused on Liv, so thankful and so in love, it’s not what mattered. I worked out, and still do because I enjoy it, but at the end of my life, I know I won’t be thinking about that “one awesome elliptical sesh!” – I’ll be thinking about the sloppy wet kiss Liv gave me on the cheek last night before putting her in her crib. At the same time, I hoping that my commitment to health will help me enjoy a longer life. The skinny jeans will always be there. The chance to create beautiful memories? Fleeting. If you are pregnant or have had a baby, I implore you to check out this incredible short film about the transformation of bodies and bellies post-childbirth. Update: My Post Baby Bod Fitness Plan is now available! Post Baby Bod - claim yours now! You look amazing for even someone who has not had a baby!! This post reflects EXACTLY why you are my fave blogger! You are so honest and real and have such a balanced view on healthy living! Life is too short to be “perfect” all of the time! I truly appreciate your honesty and dedication to being a fantastic mom, first and foremost! Thanks for this post! I have a couple of questions, mostlyabout abs. I have a 15 monthand like you also gotsomestretchmarks. I still have some sagging and looseness, and I was wondering if you had any tips on what you did to tone up. I am at a healthy weight,but would love to work on my abs. I still have a little pain sometimes when doind core work. what a great post Gina. You look SO amazing, and the most important thing is that you got to this place in a healthy and realistic way. loved your point about sleeping > working out. rest is when all the good things happen, and i am so happy you pointed this out! Gina, you look amazing and your daughter is beautiful…that’s a fact! I also want to add that I appreciate how you’ve kept up your blogging. Most of the new momma-bloggers out there sorta lose focus after their baby. You’ve maintained a high level of interesting topics and diverse material. Your blog hasn’t suffered at all since Liv was born. In fact, I think it’s even better now! Truly, you are a talented momma and blogger! “Alive” – I think your blog is THRIVING! As I whittle down the blogs that I read, I never think of getting rid of yours. I’ll always make time to read yours! You look great! You are a healthy role model for younger women like myself who read about your pregnancy and post pregnancy experiences. You help me set a healthy expectation for myself for when I get pregnant (which is FAR in the future for me) Thanks for always sharing! You look amazing – healthy and fit! Really you’re such an inspiration. Thanks for sharing all this. I’m now at the stage where hubby and I are thinking of kids and I’m fascinated to read other people’s real experiences. It takes some of the scary out of it. So thank you! I’m 26 and have always been terrified of having children, partly stemming from a fear of gaining weight after pregnancy. Thank you for giving me a different pespective. Now, I think it’s sad that our society places so much pressure on women to be thin that I ever considered missing a joyful experience in order to stay thin. Truly, reading your family blog has been eye-opening and made me hopeful that one day, I may want children too. This is an absolutely beautiful post! I love your approach to losing the weight. You seriously are a wonderful, strong and inspirational person. Thanks for this, even though I am not planning on having children for a while- I will always remember this post. Thank you for this post. I’m only 2 months pregnant and although I don’t have a baby bump yet, I see the weight gain and some days it bothers me. I haven’t exercised as I normally would, partly because I’m exhausted from full-time work by the end of the day, and partly because I’m nervous about doing anything I shouldn’t be doing. P.S. Thanks for your reply to my email! the appetite for green veggies will come back.. for now, just enjoy what your body is craving. Breastfeeding doesn’t give you saggy breasts it’s the pregnancy. I gained a total of 65plus lbs with my first pregnancy. I didn’t start to try to Lose weight until my son was around 20 months. Even though I got back to my pre pregnancy weight when he was around 21/2, my jeans still didn’t fit until 6 months after reaching the pre pregnancy weight with focus on abs and hips. Also, the hips expand with each pregnancy :O. This pregnancy I’m being a little more careful with my weight gain. Learned my lesson! Thank you for this post. I am finding it a little after the fact of you posting it, but it really hit home for me. We are going to start trying in April and my Doctor just told me this week that I need to start getting ready. I am going to go back and re-read all of your post now! I want to be a healthy mom for my kids and myself, I have always worried that I would gain so much weight and then not lose it. Over the years the pounds have been slowing adding up and I really need that push to get me jump started again. Thank you for this post and I can’t wait to go back and read the rest. 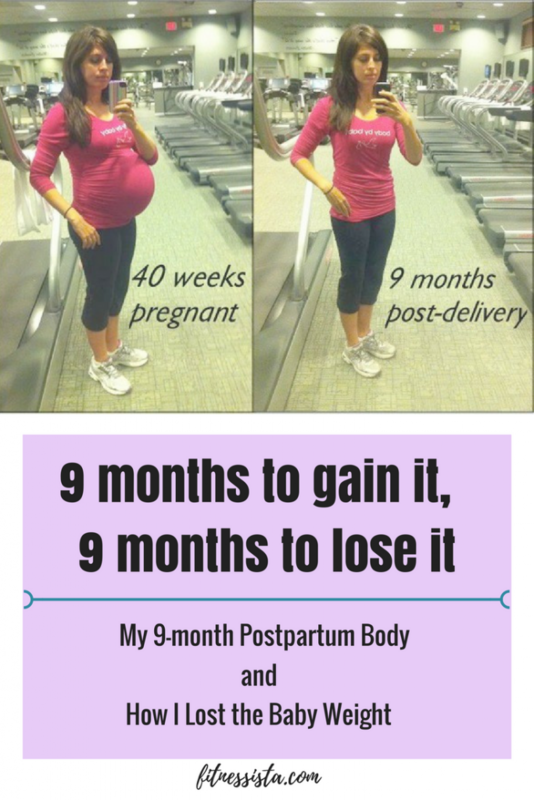 Thank you for the encouraging, honest and down to earth post on post-partum weight loss! 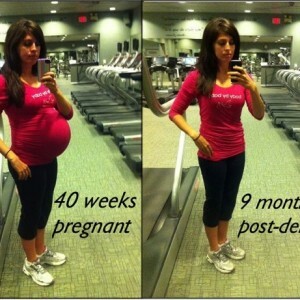 You did an amazing job taking care of yourself pre- and post- partum clearly! I gave birth to my own beautiful baby boy 8 months ago and have been struggling to peel off the weight I gained, despite a pretty rigorous workout schedule. I just can’t seem to get the last ten pounds to budge… and on top of it all, a dietician suggested to eat pretty much like a horse since Im breastfeeding a so active. Im not sure quite how to ask, but how did you find the ‘happy intake’ level that let you lose weight while not feeling lethargic/famished. Before when I was counting calories, I felt like crap, and so have since stopped, and followed my hunger cues, but just cannot get the weight to budge since Im SO hungry (i eat lots of veggies, fruits, whole grains, lean proteins etc. with occasional yummytreats…). So, how did you find an intake level that would fuel your breastfeeding and workouts, while encouraging your body to shed the weight gained? Any tips would be very helpful! i didn’t really lose the last bit of weight until i stopped breastfeeding. my body was holding onto it to make milk, but i pumped until i had nothing left and then lost the rest. i was just focused on working out smarter when i could make it to the gym, and eating clean at home. i would definitely make sure you’re eating enough to sustain breastfeeding (lots of fat and protein) and make sure you’re not overdoing it with the workouts. working out LESS actually helped me lean out.